Book Bloggers International: Join Us For THE HATE U GIVE and a Challenge! Good Morning, and Welcome to July! 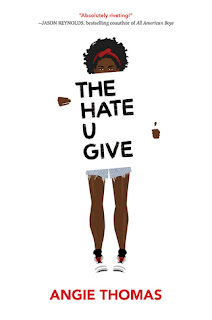 This month here at Book Bloggers International, we are going to be chatting about THE HATE U GIVE by Angie Thomas. We are not only going to be chatting about this book this month and how it relates to our current state of the world, but I am also going to be throwing a challenge out there for you each week. But first, let us look at the book we will be reading together (description from Goodreads) . . .
Each week, we will read a select group of chapters and then discuss the content in those chapters. Some may feel that they need to fly through the book without sticking to the schedule. That is okay. The only thing I ask is that we do not share spoilers for the parts of the book that we have not yet discussed. In other words, you can read ahead, but don't discuss ahead of the schedule! Before we close out, there are two additional items we need to address . . . introductions and our weekly challenge. INTRODUCE YOURSELF: If you will be reading and/or discussing along with us, chime in on the comments below. Or, post about it on your own blog and share the link in the comments. Tell us where you will be sharing any additional thoughts in the social media world as you read (i.e., Twitter, Instagram, etc.). WEEKLY CHALLENGE: As the name of the title implies, we are going to be addressing HATE. Let's start out our month and our readalong with a little bit of LOVE. I challenge you to perform one random act of kindness this week, then check in below in the comments section and let us know if you completed it. You do not need to share details because that kind of defeats the purpose of the random act of kindness, but do let us know that you performed an act of some sort and your own personal response. Happy Reading! I look forward to reading this one with you all this month! Love your blog! I'll try my best to read this one too as it seems very relevant to what is going on these days. El K ... Thank you! I hope that you can join in the readalong with us. I'm looking forward to reading and chatting about it! I am so excited to read this book with you all this month! I performed my random act of kindness, and can I just say how good it felt?! I'm going to chime in and try not to do spoilers, but I've been listening to the audio. Not sure where the chapter breaks are at this point. This book is so intriguing. I perform random acts of kindness quite a bit, and I like doing it. I'm glad you're challenging others to enjoy it too. Serena ... I'm so glad you will be joining in!! I will do my best each week. Summer swim team is brutal! Serena ... I totally understand! My kids' schedules right now is CRAZY! !